Normandy Beach Firm JJC inc is waiting to find out if they will be counted among the Top 500 Remodelers of 2012. If they are, JJC inc. will have another plaque to add to their already prestigious collection of awards. Normandy Beach Engineer John Chando would be honored to receive this award. 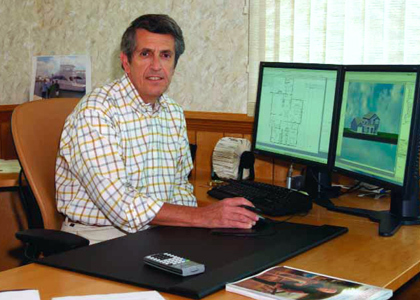 Normandy Beach, NJ building designer John Chando has earned the trust and respect of thousands of clients over the past 30 years. He runs a firm that is committed to honesty, responsiveness, and availability. As it happens, when someone operates their business like this, they tend to be recognized. JJC Inc has been on the Qualified Remodelers Top 500 List ten times since 1993. A company doesn’t receive that honor just for subscribing to the magazine every January. There are certain criteria that a business must meet, and John Chando is waiting to see if 2012 will mark his 11th award. John Chando has been remodeling homes in Normandy Beach, NJ since 1978. His team of thought provoking, forward thinking architects and engineers makes him confident that their is no better choice than JJC Inc for design-build services. He specializes in coastal home remodels and new construction. He recently completed a residential remodel that wired the entire home with “smart” technology that would make Bill Gates proud. To apply for the 2012 Top 500 list JJC Inc had to send Qualified Remodeler Magazine an application that included installed remodeling volume, total years in business, industry association memberships, industry certifications, and community service. If he is awarded, an upcoming press release in August will announce his win and his company’s name will be in black and white on the Top 500 list in that month’s edition of the magazine. He will also be invited to a special reception in October 10, 2012 that will have more awards and an unannounced guest speaker. Everyone at the Normandy Beach design-build firm is on pins and needles waiting to find if they will be honored again this year. After all John can always remodel his office to make room for more plaques. This press release was prepared by Bobrow Consulting Group (BCG) for JJC Inc. BCG works with building design professionals to build their business by optimizing their online strategy, teaching marketing for architecture firms as well as offering web design and SEO consulting services.